The human body is primarily composed of water. Water is not only beneficial but also vital to life – only oxygen is more important to human survival. Water plays an enormous role in how well our body functions. Simply put, the more fresh water we drink the healthier we become. Water supply can be contaminated by bacteria and viruses through contamination from industrial waste, sewerage, dumpsite etc where contaminated water is seeped / flowed into the reservoir or leaking pipeline that supply water to residence. Some of these bacteria can cause stomach upset or diarrhea. Harmful chemicals such as gasoline, solvents, and pesticides can get into our drinking water. Natural chemicals like arsenic, manganese, iron, and radon can also get into your drinking water. This is possible due to chemicals pesticides and fertilizers being us in farming discharging of waste water from factories. An adequate supply of dissolved oxygen gas is essential for the survival of aquatic organisms. A deficiency in this area is a sign of an unhealthy water quality. There are a variety of factors affecting levels of dissolved oxygen. The atmosphere is a major source of dissolved oxygen in the water. If our drinking water lack or is with too much of dissolved oxygen, the water become unhealthy for human and even animals or plants consumption. Turbidity is the condition resulting from suspended solids in the water, including silts, clays, industrial wastes, sewage and plankton. Such particles absorb heat in the sunlight, thus raising water temperature, which in turn lowers dissolved oxygen levels. Colour in the municipal or drinking water maybe the result of high turbidity or is contributed by high level of iron and rust particles in the water. Taste and odour in water may occurred due to presents of chemicals such as chlorine, sulfur and other chemical pollutants. Such chemicals maybe harmful to human and are sometimes carcinogenic. Chlorine prevents the growth of bacteria and micro-organisms in the water and its has been used by municipals to treat water before sending to consumers. Acting as a food preservative, it is responsible for maintaining water quality throughout the whole of the water supply system. Used in small doses, chlorine is harmless. On the contrary, it is a powerful disinfectant which prevents any possible contamination of the water. But excessive chlorine in the water maybe harmful to human health. Chlorine is found to be carcinogenic and cancer causing. While the local municipal treats and sterilize the water before sending it to consumers, the clean water may become contaminated while passing through old and rusty pipeline. It is even worst when the pipeline are leaking due to rust and age as pollutants, bacteria, heavy metal and other to toxic substances will enter through the leak and contaminate the water. Prior to discharging the water to the housing estate or high rise building, the local municipal or developer may have a secondary storage tank to contain the water. Such storage tank which is old and without maintenance will be a good breading ground for bacteria and pathogen. This will cause water to be contaminated. 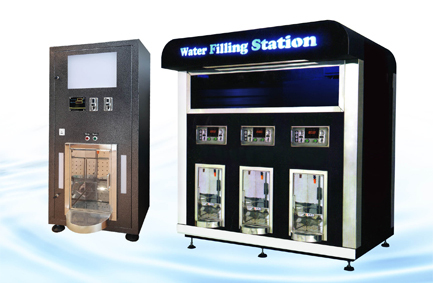 Water vending machines are the ultimate machines to earn money for you, the distributor, the franchisor, the owner and operator. The machines are sophisticated medium sized water purification machines, that are connected to an incoming water source (usually tapwater) and electricity. Through a system of high tech filtration, reverse osmosis and sterilization, they produce pure sweet water from nearly any source water. Why Drinking Water From Vending Machine? (a) There are increasing needs of pure drinking water to replace carbonated drink consumption. World wide medical & nutritional researches convince the very high benefits of pure drinking water for human to maintain the good health. (b) There are much differences of the retails price between Drinking water in bottles and Drinking water from water vending machine. (c) Filling the water from Vending machine into your own-re-used bottles is the only way to keep our environments free from millions of bottles which had been disposed everyday on our earth. Come to join us to reduce the waste on our earth today! How Safe is Drinking Water From Various Sources? Bottled water is not pure water, as nearly all bottled water contains dissolved substances. The FDA regulates the quality of imported bottled water and bottled water distributed through interstate commerce. FDA has established allowable levels for a number of potential contaminants. Bottled water cannot contain more than the allowable level for any given substance. While there are a few differences, the allowable level for various contaminants allowed by the FDA in bottled water is essentially the same as the maximum contaminant levels that the EPA allows in public water supplies. If a bottled water producer is in full compliance with regulations, the water should be suitable for drinking and cooking. The levels of dissolved substances in bottled water varies among different companies depending on source and treatment. You may be able to obtain information about the quality of the water being provided by reading the bottle label and contacting the bottling company. Bottled water must comply with FDA’s quality standards, although not all potential contaminants are regulated and there is always some risk of contaminants going undetected between testing intervals. Bottled water may be treated prior to bottling, and treatment methods can vary from one company to another. Possible treatment includes activated carbon filter to improve odor and remove chlorine, hydrogen sulfide, organics, pesticide and radon; cation exchange to remove dissolved calcium and magnesium; microbiological filter to filter out bacteria, protozoa, parasites and viruses; reverse osmosis to reduce heavy metals, nitrate, sodium and sulfate; and ozonation or ultra violet to disinfect the water, removing bacteria and organic matter. In the case of some mineral waters, water (usually from a public water supply) may be treated to remove nearly all minerals, and a custom mineral mix added to the water. Vended water comes from a public water supply. Since it meets EPA drinking water standards, it is safe for human consumption. Additional treatment may occur to reduce dissolved substances and disinfect the water supply. While you can expect the water from a vending machine to be potable, inadequate cleaning or unsanitary handling of the vending machine or the container used to collect and store the water could result in bacterial contamination. Good sanitation measures are important to keep vended water safe. What is the difference between the different types of bottled water anyway? Mineral water, still water, sparkling water, seltzer water and club soda, sterilized water, and distilled or de-mineralized water….What do all of these have in common? They are all different types of bottled water. So what is the difference? Vended Water from Vending Machine uses high technology filtration system that removed all heavy metals and enhance the water with beneficial minerals and at pH 8 which is mild alkaline and is good for human consumption to neutralized the acidic in our present human body. Fibre Casing or Stainless steel body square shape. Water selling price can be program into any price on custom request. Machine is equipped with disconnect devices that breaks circuit when it detects leakage of electricity. Out Casing Finishing with anti-stick Photocatalyst paint for prevention of illegal stickers and anti graffiti. 60 days upon received order. 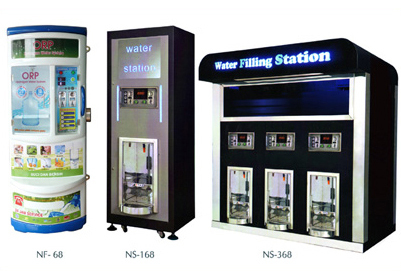 We at Nano Silver Manufacturing Sdn Bhd can fulfill customer requirement for any type of water purifying system for the water vending machine with our experience and knowledge in water filter system field.